“Every meal in Brighton should start like this,” I grinned to my partner Tommy as I sipped a glass of fizz and gazed down at the Lego-sized people on the beach below. 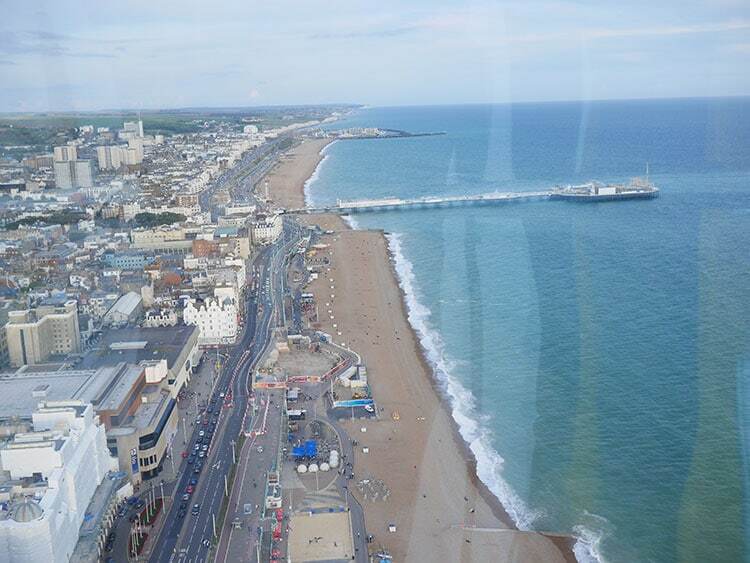 We were suspended 138-metres above the city in the i360’s glass viewing pod, which celebrated its first anniversary this summer. 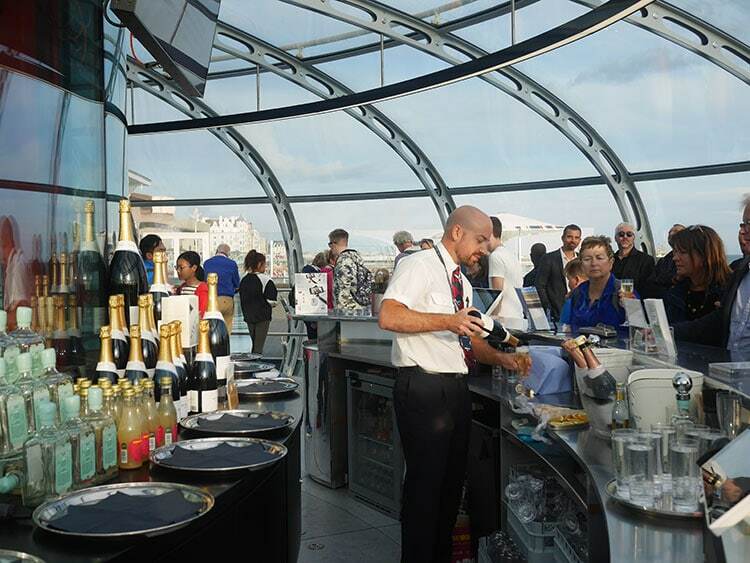 As we picked out the Palace Pier, Royal Pavilion and, in the distance, the Seven Sisters, we sipped locally sourced beverages from the Nyetimber Sky Bar, which is stocked with Brighton gin, Sussex wines, local ales and Wobblegate juices. After ten minutes at the top, we descended to beach level and, as the glass doors slid open, we walked through the gift shop to West Beach Bar and Kitchen. 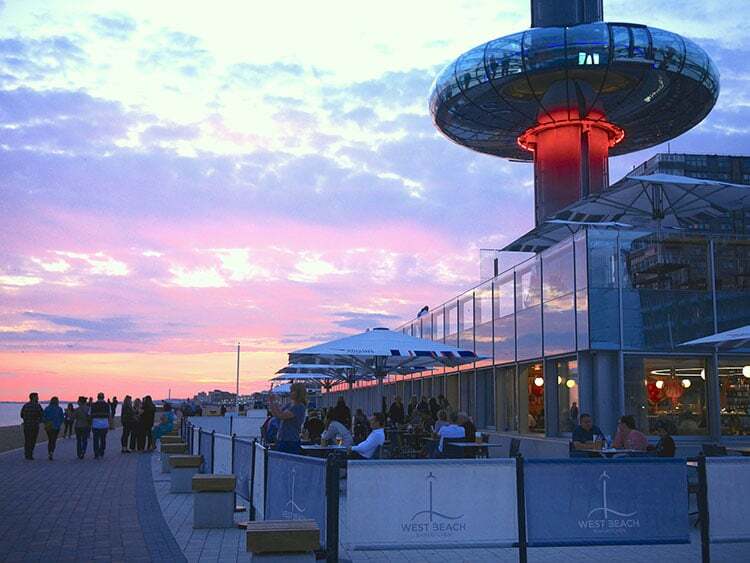 Seamlessly integrated into the BAi360 experience, this new addition to Brighton’s seafront opened in August to coincide with the tower’s first birthday. 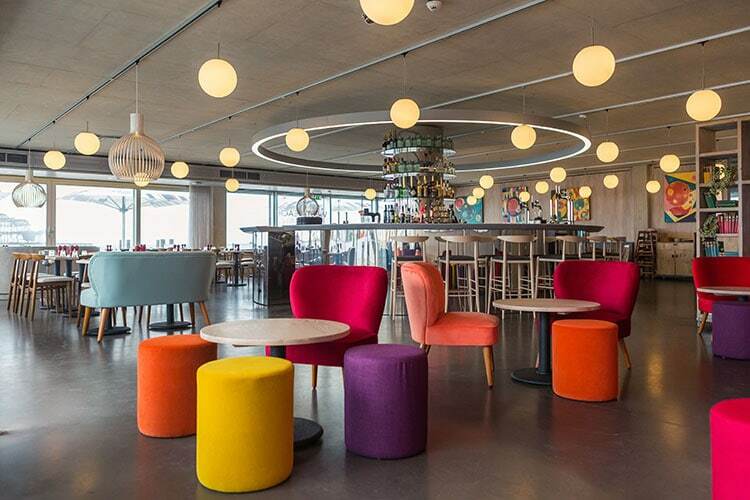 The interior is very ‘Brighton’ with quirky artwork, an all-glass frontage and a beachfront terrace that’s directly opposite the West Pier. 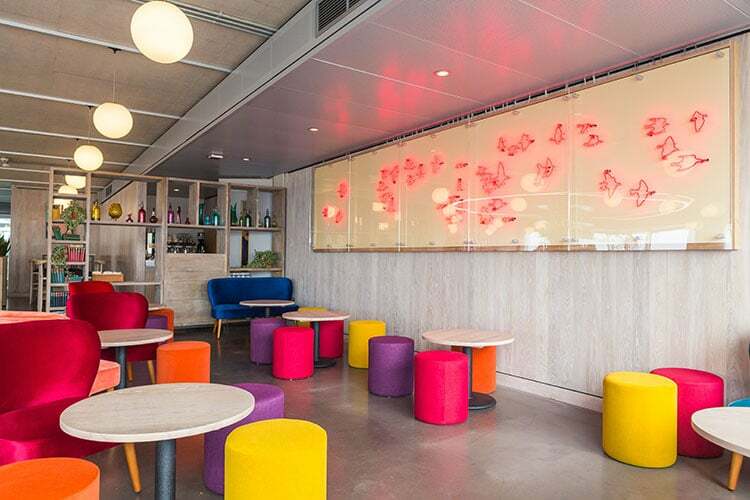 This widescreen view and stylish yet informal ambience makes West Beach Bar and Kitchen a great choice for alfresco brunches and sunset drinks, as well as lunches and evening meals. Even better, the menus are reasonably priced. Nibbles start at £3.00, small plates at £4.00, and mains start at £8.50. Not bad at all for an on-the-beach eatery. 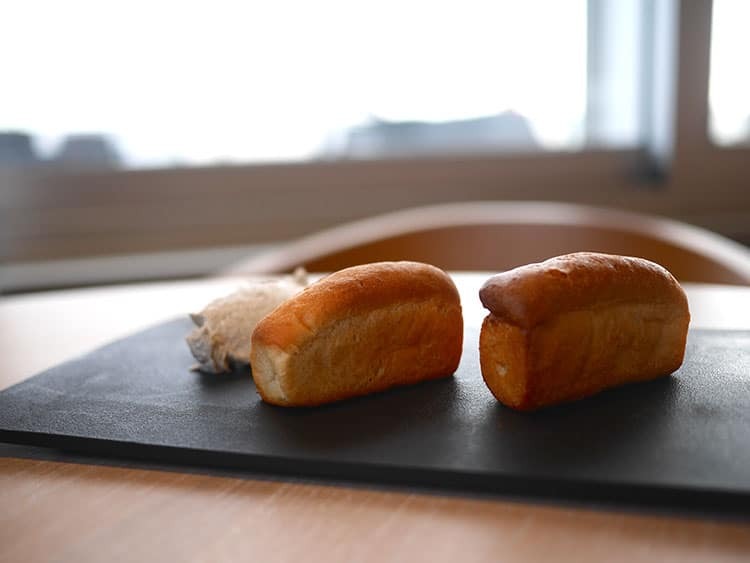 As we mused over the menu, we were served two tiny loaves of warm bread with a moreish anchovy pate. Tearing at our little loaves, we marvelled at just how special the restaurant’s setting is: with the sun starting to set, flocks of starlings pulsed above the pier. I’ve seen these ‘murmurations’ many times before but never with such a direct view. It really was quite breathtaking. 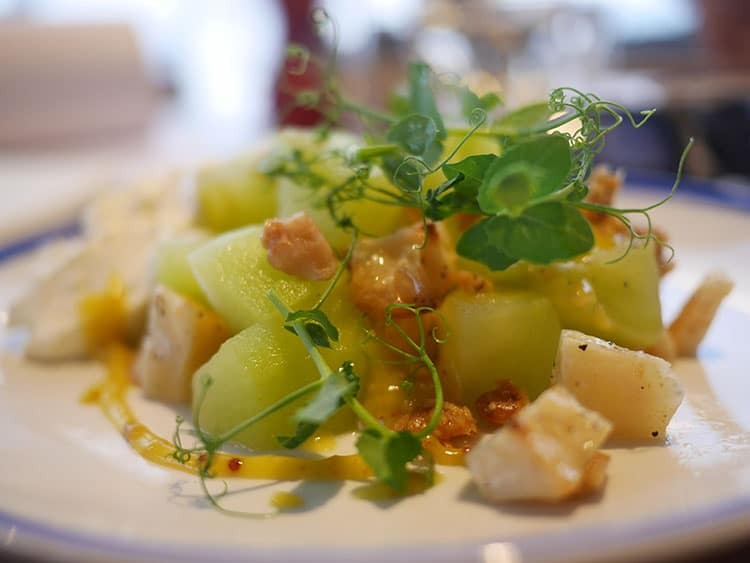 Served cold, our cubes of seasoned celeriac were tossed with chunks of compressed apple. Like a hybrid of a honeydew melon and a granny smith, the apple was firm and juicy with a sweet-sour flavour. Chewy sugared walnuts added sweetness and texture, while a big blob of crème fraiche added coolness and did a great job of bringing the bolder flavours together. 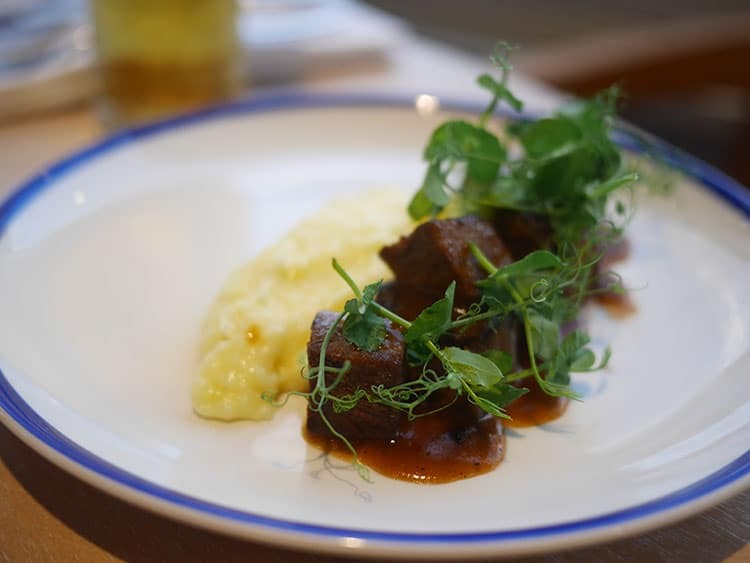 The overall effect was a refreshing dish that really got us talking. Our barbecue brisket ends were uniform, dice-sized pieces of beef served with a rich and glistening ‘mother sauce’. Like a refined version of beef casserole and mash, I could happily have eaten this comforting dish as a main – perhaps best enjoyed in winter while watching a storm roll in. 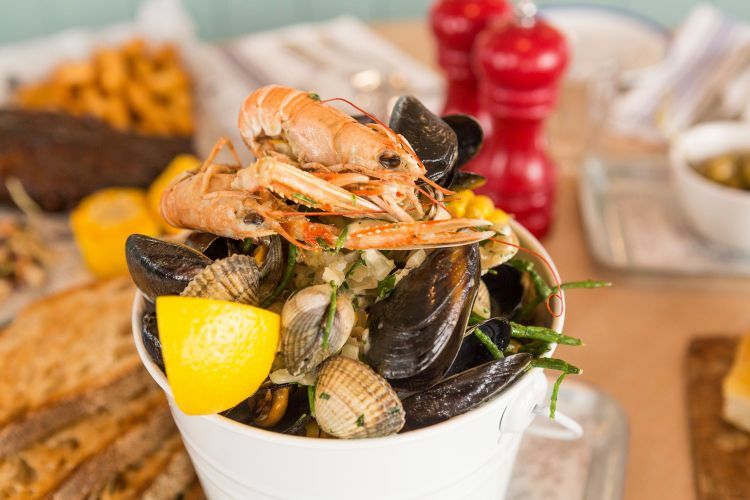 For our main, we shared a ‘Brighton Bucket.’ As promised, our medley of shellfish arrived in a seaside-style bucket, which our waitress tipped into a big tray for easier sharing. 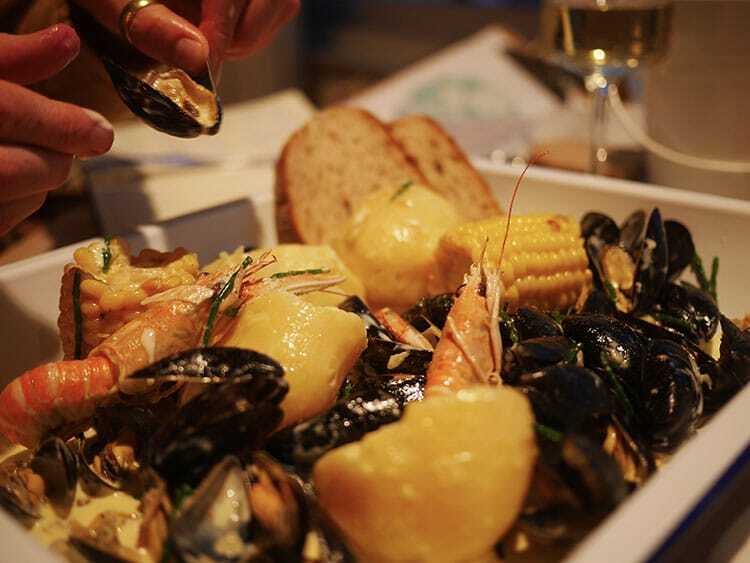 A rustic dish that is best approached by getting stuck in with your fingers, we slurped, scooped and cracked our way through mussels, clams, cockles and langoustines, all drenched in a thick, cider cream sauce. 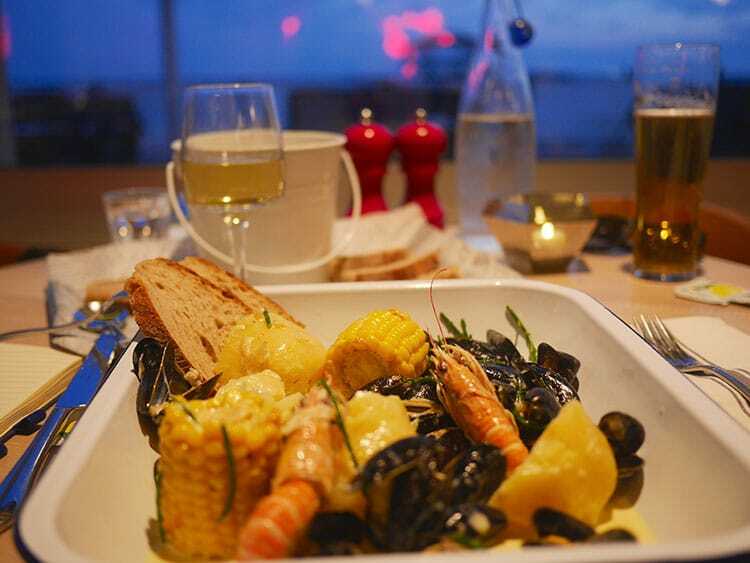 In with the shellfish were whole potatoes, half corn-on-the-cobs, and vibrant sprigs of salty samphire. Wedges of lemon and slices of wholemeal bread from Brighton’s Flour Pot Bakery were served on the side. The blood orange posset we shared for dessert was a great choice that I’d definitely order again. Peachy-orange and topped with a golden husk of local honeycomb, the delicate and ever-so-subtle bitterness of the posset’s blood orange flavouring was an inspired idea that cut through the richness of the creamy posset. 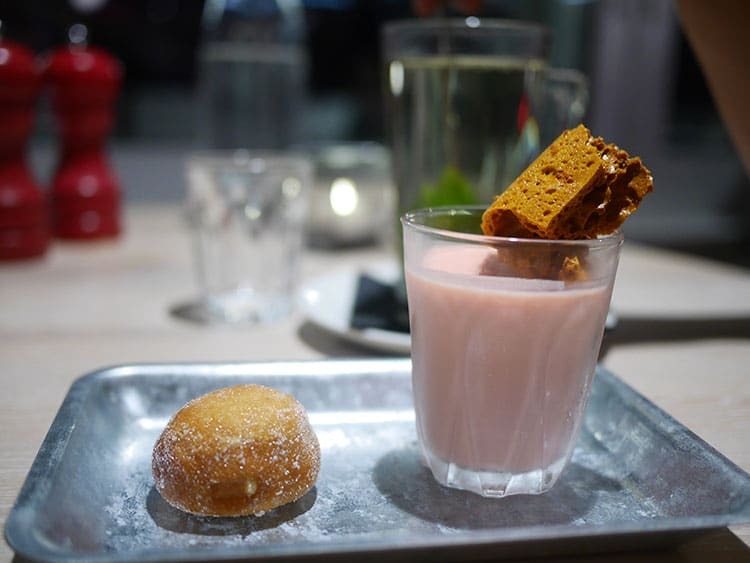 Velvety smooth, our posset was served with a mini homemade doughnut, which was sugared on the outside and filled with zesty lemon curd. 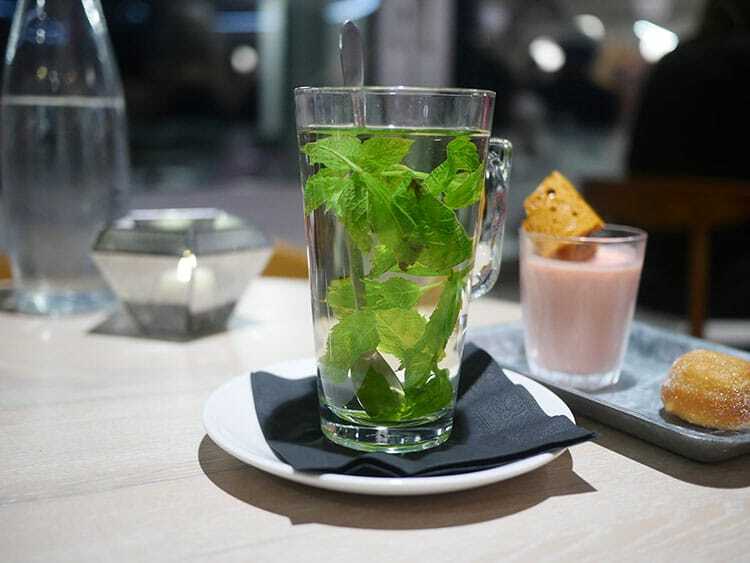 We finished with fresh mint tea, served in elegant glass mugs. As we sipped, we gazed out at the skeleton of the pier, now magically bathed in moonlight. 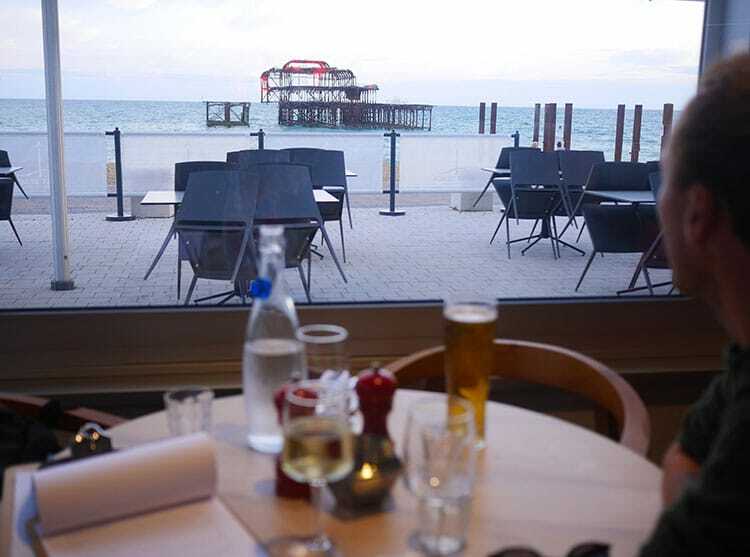 Coupled with our BAi360 flight, we had a thoroughly ‘Sussex’ evening of locally-sourced cuisine and truly privileged views – loyal to its Brighton base, this new addition to the seafront really does have the best seats on the beach.